The Acadian Museum of Erath will honor Edward Joseph LeBlanc for his activities and work in promoting our Louisiana culture and heritage. The Museum will induct him into the “Order of Living Legend” on August 11, 2007, adding him to an elite list of people who have distinguished themselves for their service to their culture and heritage. Edward Joseph LeBlanc (E. J.) achieved great accomplishments in serving his country and his community. E. J. was born in Erath, Louisiana, on October 20, 1925. His parents were Claude LeBlanc, fur trapper and commercial fisherman, and Adella Suire LeBlanc, housewife and loving mother. E. J. had two brothers and three sisters. E. J. attended Erath Elementary School. As with most Cajun families, growing up in a large family, on a rural farm, was difficult. Children had to help their parents. E. J. was no exception. He had to quit school and help out with the family income. 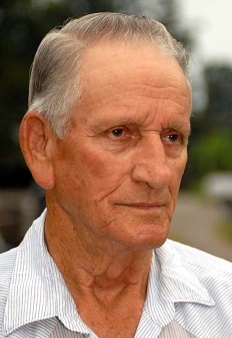 Claude LeBlanc was the prominent commercial fisherman in Ward 1 in Vermilion Parish. E. J. and his brothers helped their father seine for fish. With his father also being a fur trapper, the family lived on Marsh Island for three months of the year and trapped. At age 17, E. J. trapped for George LeBlanc, from Erath, La. He ran 200 fur traps in a 2½ miles radius, everyday during the trapping season. Earning a supplemental income of $1800. While trapping he encountered an incredible experience. He wrestled and killed a 7-foot alligator, with nothing but a pocketknife. At 18, he received a letter stating that he was being drafted for World War II. His mother said, “You are not fit to be drafted, you are too skinny”. On May 11, 1944, E. J. was accepted into the United States Army. He did his basic training at Camp Fannon, Texas and Camp Swift, Texas. He qualified as Expert in Rifle M1, Carbine, Mortar, Auto Rifle and Grenade. Private First Class Edward J. LeBlanc, 10th Mountain Division, 85th Mountain Infantry Regiment, Company E, left Camp Swift en route by train to Hampton Roads, Virginia. Crossed the Atlantic Ocean on the USS West Point Ship and landed at Naples, Italy. E. J. (“Frenchie” to his platoon) served his tour of duty in Italy during the American Theater Campaign in the PO Valley and North Apennines Mountains region. E. J. fought in 2 major battles during his tour. 1st battle was fought on Mt. Belvedere and lasted about three weeks. The 2nd battle was fought at the edge of the PO Valley where the mountains ended. Even though it’s 62 years after World War II, E. J. clearly recalls when he earned his Silver Star Medal. “Our Staff Sergeant - Sergeant King was killed and the platoon was really pumped up. I was the 1st scout for my platoon. That night we dug into foxholes. I heard two guys talking and walking on the ridge. I did not know who they were or what they were saying. They opened with rapped fire about 25 feet from me. I returned rapped fire with an automatic rifle. I then knew they were Germans. I killed one and wounded the other. At daylight on April 16, 1945, near Mt. Della Spa, Italy, the company started moving forward. As 1st scout, I was ahead of them. I went down a ravine. The Germans, across on the other ridge, opened fire on the company. I couldn’t go back because they would shoot me. I kept on going down the ravine. I noticed a road at the bottom of the ravine. I crawled through a culvert to the other side of the road. The Germans were about 25 yards from me. I threw a grenade into their foxhole. I opened fire on the foxhole. I then heard the Master Sergeant shout, “look to your left”. About 50 yards from me, there was another foxhole with three more Germans. They had their hands up in the air, waving a white flag. The Germans were surrendering. In the meantime, the Master Sergeant came running to me and said they were all dead in the first foxhole. I killed 3 Germans, wounded another and captured the three Germans that surrendered. The company started pushing forward again. The Master Sergeant recommended me for a “Silver Star”. “Later that day I walked through a wheat field to a farmhouse in search of more German soldiers. I went into the barn, looked around and hear someone in the barn loft. It was a German soldier with his rifle above his head. He was surrendering”, said E. J. On May 25, 1945, Command of Major General Hays awarded E. J. for conspicuous gallantry in action, the “Silver Star”. E. J. remembers, “My tour of duty in Italy was a very cold winter. Missouri Mules carried our supplies in the mountains. The war was very hard on the soldiers”. E. J. was awarded the Silver Star, Bronze Star, Good Conduct Medal, World War II Victory Medal, Europe -Africa-Middle East Medal with 2 Bronze Service Stars, Combat Infantry Badge, and American Theater Campaign Medal. He received an Honorable Discharge on November 19, 1945, at Camp Carson, Colorado. Returned home after the war and helped his father and family. His father built his own personal boats and E. J. learned the boat building trade from him. E. J. built his first boat, a wooden 18-foot V-bottom boat. This started his love for building boats. E. J. attended trade school and became a welder. Moved to Port Arthur, Texas and worked as a contract welder for an oil refinery. Working throughout Texas. In 1948, married Gloria Mae Champagne, daughter of Otto and Beulah LeBouef Champagne. In 1949 become captain of a 68-foot shrimp boat, owned by Dr. Mouledous, from Abbeville, La. Shrimped out of the port of Brownsville, Texas for about 4 years. In 1953 started working in the oilfield industry for Odeco Drilling. Became the captain of a 140-foot supply boat. Worked out of Louisiana and Mexico and operated the supply boat off the coast of Louisiana and Mexico. With his knowledge of the trade and love for boats, E. J., on his days off, started building boats out of a garage behind his house in Erath. In 1960, he relocated his boat building business to a 50 x 50-foot building on Hwy 331, just out of Erath. There he built wooden pleasure boats. In 1964, as Post Commander, E. J. built and donated a wooden V-bottom boat for a raffle fundraiser to the American Legion Post # 279 in Erath, La. With a large demand for custom-built boats, in 1970, he again expanded his business to a 6000-sqaure foot building, known as LeBlanc’s Boat Works. When wood became scarce he started using aluminum to build his boats. Upon their graduation from high school, his sons, Carroll (Bubba) and Carl Joe, started working for him. They built aluminum commercial boats (crew boats, charter and work boats) and aluminum pleasure boats (yachts, fishing and hunting boats). Also repaired all types of boats for Erath and surrounding areas. In 1978, E. J. and his sons constructed his own 51-foot commercial shrimp boat. E. J. retired to fish and hunt, leaving his sons to run the boat building business to present day. Their custom-built boats can be seen throughout the southern portion of the United States, California and the Bahamas. E. J. and Gloria (retired Vermilion Parish school teacher) had three children: Mary Catherine, married to Leewood LeBlanc; Carroll Edward, fiancé Nancy Pere; and Carl Joseph, married to Pamela Dugas. Seven grandchildren: Keith LeBlanc, married to Annette Durand; Keisha, married to John Carl Broussard; Ashley LeBlanc; Kipp LeBlanc; Shaina LeBlanc; Heather LeBlanc and Nikki LeBlanc.